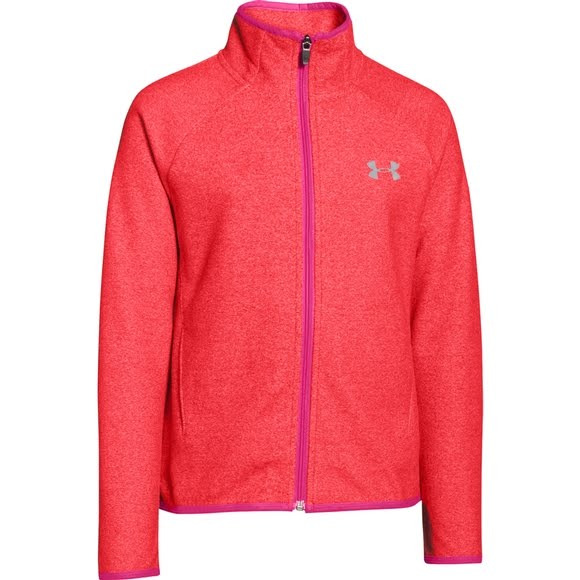 A loose, generous, more relaxed fit ensures that the Under Armour Girl's Youth UA ColdGear® Infrared Fleece Full Zip feels as good as it looks. ColdGear® Infrared technology combined with soft, textured microfleece keep you warm in chilly conditions. Reflective logos provide greater visibility for when you are active in low-light outdoor conditions. A loose, generous, more relaxed fit ensures that the Under Armour Girl&apos;s Youth UA ColdGear® Infrared Fleece Full Zip feels as good as it looks. ColdGear® Infrared technology combined with soft, textured microfleece keep you warm in chilly conditions. Reflective logos provide greater visibility for when you are active in low-light outdoor conditions. My daughter is very particular on her clothing and color choices. We looked high and low for this color combo. I've not purchased Under Armor clothing before so I wasn't sure what to expect quality wise but we were very satisfied with the quality. Size seems to run a little big and wider than The North Face. But she loves it!